Seametrics flow measurement is committed to providing a broad range of flow metering products for the Industrial/Municipal and Irrigation industries in addition to a variety of OEM applications. Since 1990, Seametrics flow measurement has been providing high-value flow meters and controls. The guiding principles have been common sense, simplicity, economy and durability. We started with mechanical insertion meters that extended the bottom of the flow range and were easy to repair. Over the years our flow meter product family has expanded to include electronic turbine flow meters, inexpensive and highly accurate mechanical low-flow meters, and a variety of flow meter controls and displays. In recent years Seametrics has become a leading manufacturer of electromagnetic meters (mag meters) in a variety of designs suitable to a wide range of applications. These include insertion, spool, and low-flow chemical-resistant mag meters. The WMX seametrics flow measurement Series are flanged electromagnetic flow meters for use in 3” to 10” pipe in municipal or industrial water and waste water applications where propeller meters have typically been used in the past. Because the WMX seametrics electromagnetic flow meters has no moving parts and has electrodes designed to discourage fouling, this magnetic flow meter performs well and requires much less frequent maintenance in applications where debris would impede propeller meters. There is no rotor to stop turning or bearings to wear out. Minimal straight pipe requirements allow WMX-Series meters to be used in piping configurations where there is little space between the meter and an elbow. 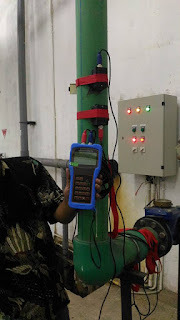 In chemical injection applications, the chemical injection point must be placed downstream of the electromagnetic flow meter OR far enough upstream for complete mixing to occur before the fluid reaches the meter. The submersible units, for electromagnetic flow meter IP68 option, are rated IP68 (NEMA 6P) for applications where the flow meters may be under water up to a depth of 3 meters for prolonged periods of time. Rate and total indication are standard on both models. Units are customer-selected and factory-set. No set-up is required. The WMX101 electromagnetic flow meters is externally powered with 8-32 Vdc at 30 mA max (see NOTE in Specifications). Two Lithium 3.6V “AA” batteries provide auxiliary power during power failures, allowing the meter to continue recording flow rate and total without interruption for the duration of the outage. Where external power loss is infrequent, battery life exceeds 10 years. The 20-foot power cable also provides pulse output for use with a variety of Seametrics and other displays and controls for remote reading, data logging, pulse-to-analog conversion, and telemetry applications. High frequency pulse rate (required for use with 4-20 mA converters) is standard; additional pulse rates are optional. The WMX104 electromagnetic flow meters is a battery-operated unit for use when pulse output is not required. Two Lithium 3.6V “D” batteries provide power and are replaceable with an approximate 1-year life under continuous use, or more depending on the duty cycle. An optional input/output cable can be installed post-factory if needed for changing applications.